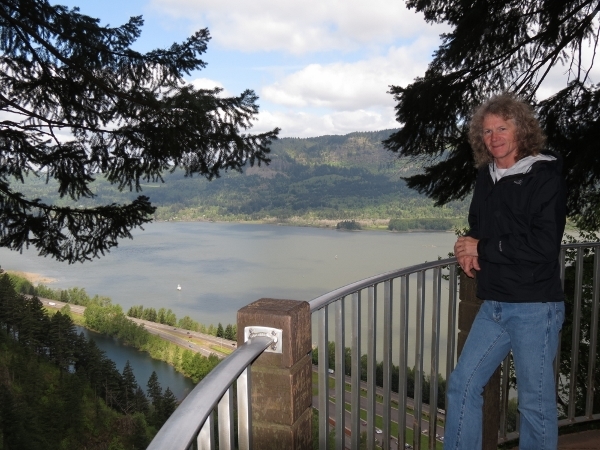 From Hood River, we returned to Cascade Falls to bike the Historic Columbia River Highway and visit the Bonneville Dam Visitor Center. 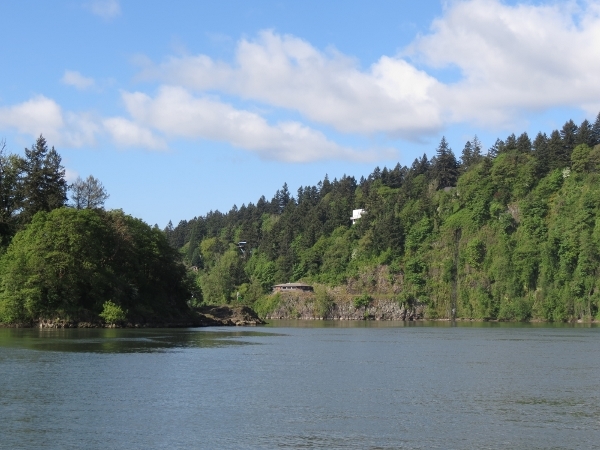 We then continued farther downstream, back through the last lock at Bonneville, through the navigable waters of the Willamette River and back to Portland for the night. 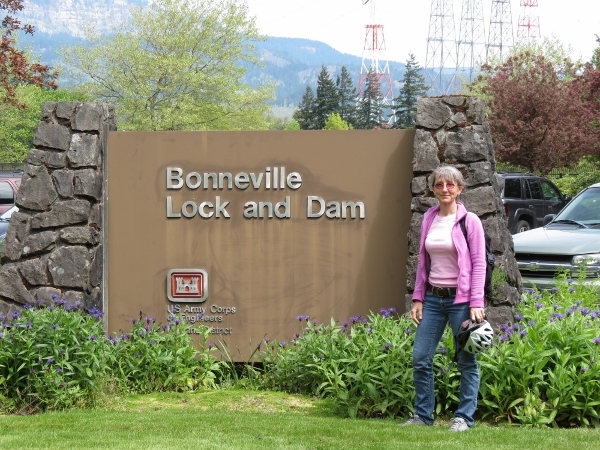 The Bonneville Dam Visitor Center unfortunately was even more unfriendly to bicycles and pedestrians than Ice Harbor was: the Army Corps of Engineers wouldn’t allow us in unless we could produce a motor vehicle. 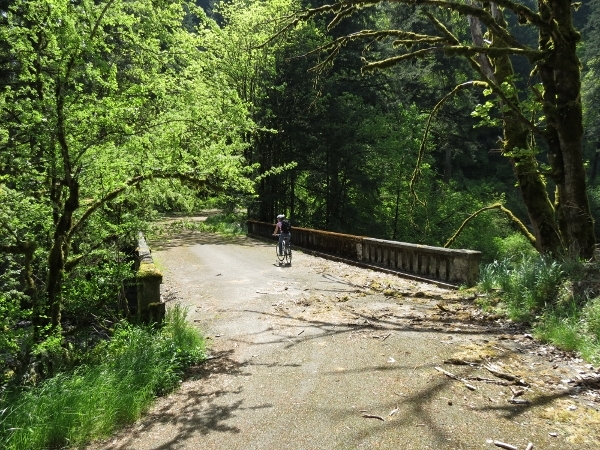 But we had an excellent bike ride along the old highway and saw many waterfalls that day and the next: Ruckel Creek, Wahclella, Multnomah, Dutchman, Ecola, Fairy and Wakheena. 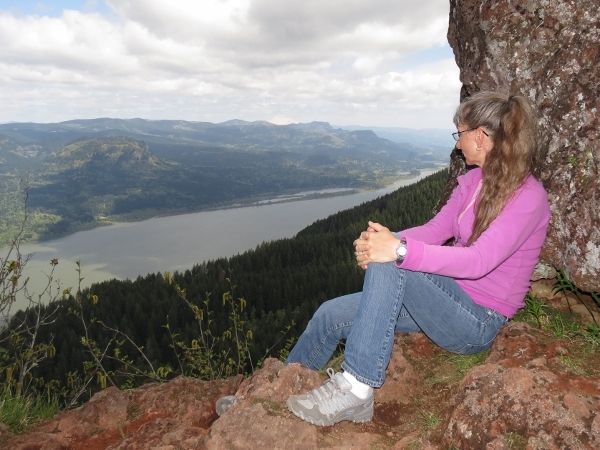 And we hiked to 2,500′ Devil’s rest for sweeping views up and down the river. 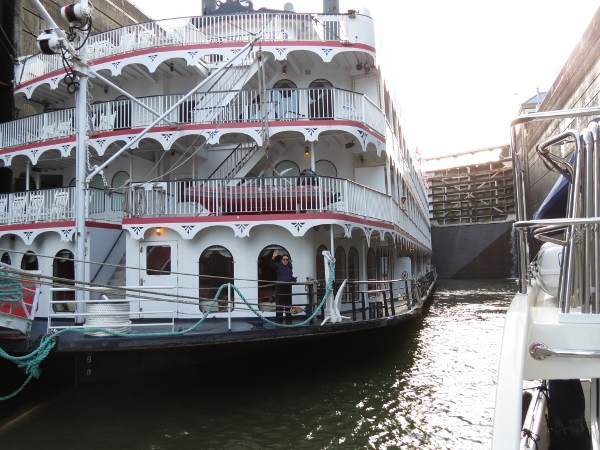 We also got a close-up view to the sternwheeler Queen of the West, tied alongside as we went through the Bonneville Lock. Here’s our log from Hood River to Portland. You also can display these on the map view. Broughton Lumber Company flume just east of Drano Lake. 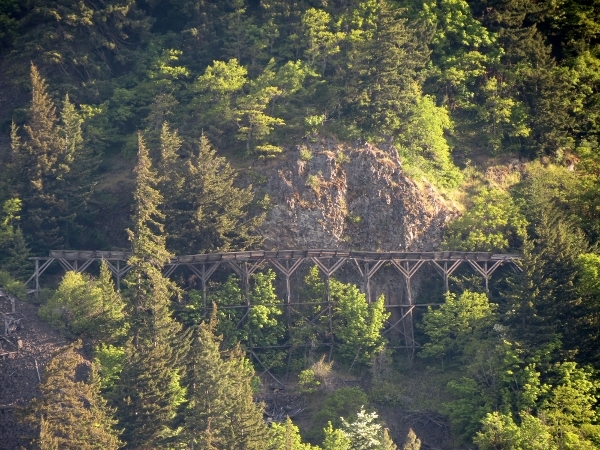 Between 1922 and 1986 the flume carried logs from a sawmill to a finishing plant nine miles away. The scenery has been pretty impressive most of the trip. 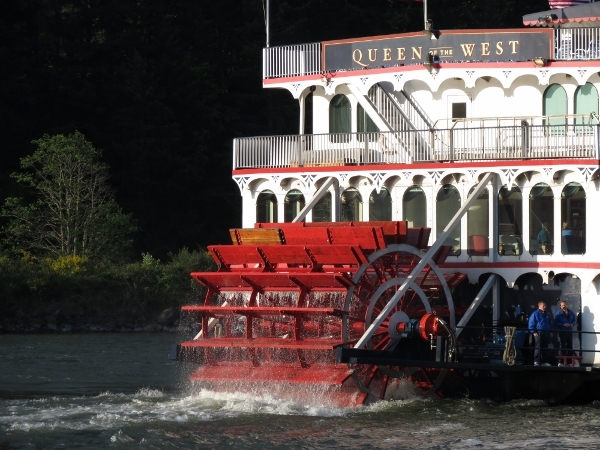 The sternwheeler we saw earlier in Richland, Queen of the West, moored at Stevenson. We didn’t know it, but we’d be getting a lot closer view of that boat tomorrow. 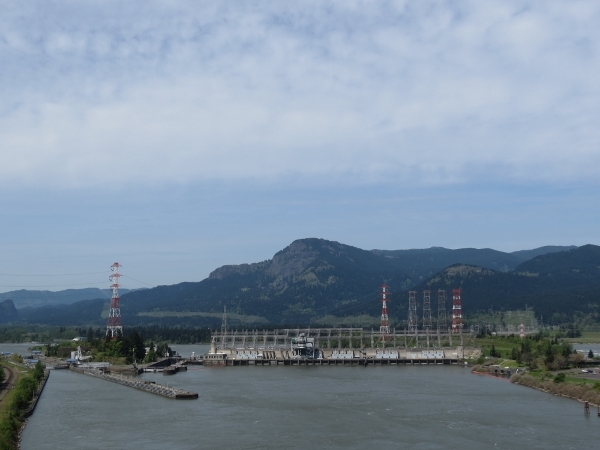 We’re back at Cascade Locks to bike along the Historic Columbia River Highway State Trail to the Bonneville Dam. 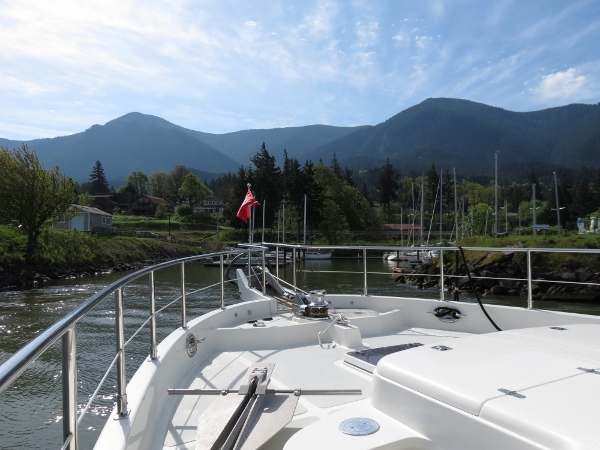 The marina entrance is narrow, with opposing wind and currents. And once past the narrow entrance, you have to make an immediate right turn onto the transient dock. That’s when you find out if the docks have space or if you have to back out. 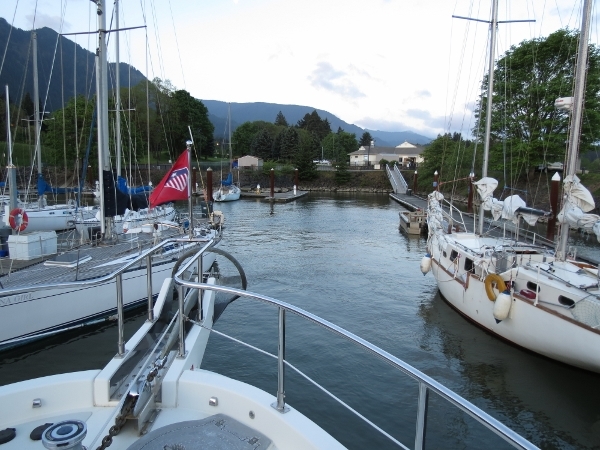 We had a bit of a tight squeeze getting in this time–sailboats were docked on both sides of the fairway. It made getting through the entry look easy. 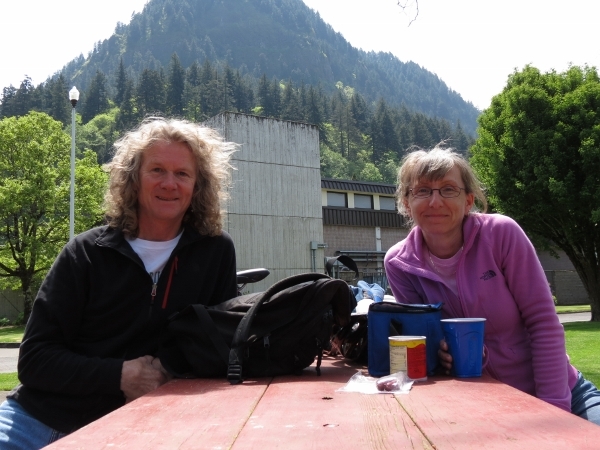 Breakfast at the trailhead beside the Bridge of the Gods. 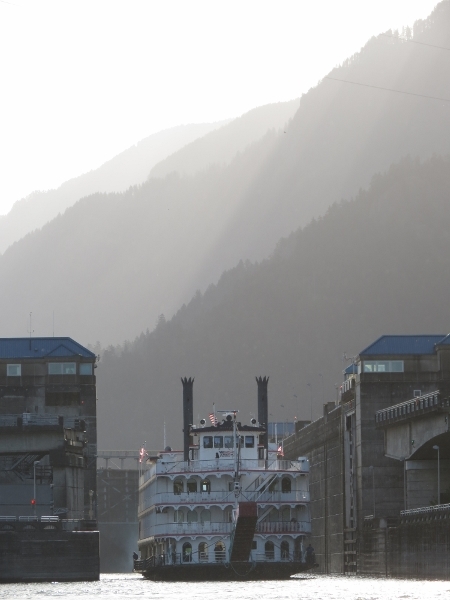 The Historic Columbia River Highway was built as a scenic route in the 1920s, but quickly fell into disuse when vehicle traffic increased and was closed when I-84 opened. Starting in the 1980s, large portions have been restored for car traffic. 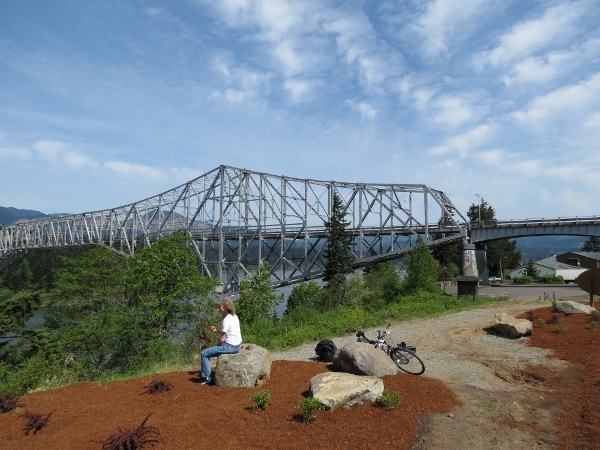 The section we’re on, from Cascade Locks to Moffett Creek, is open to cyclists and pedestrians only. 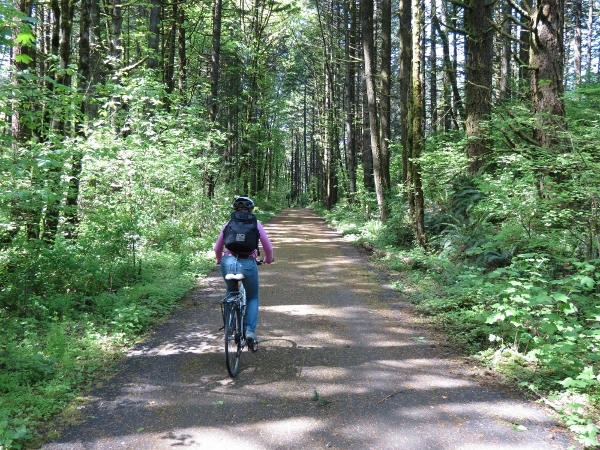 The trail is wonderful, and its nice not to worry about vehicle traffic. 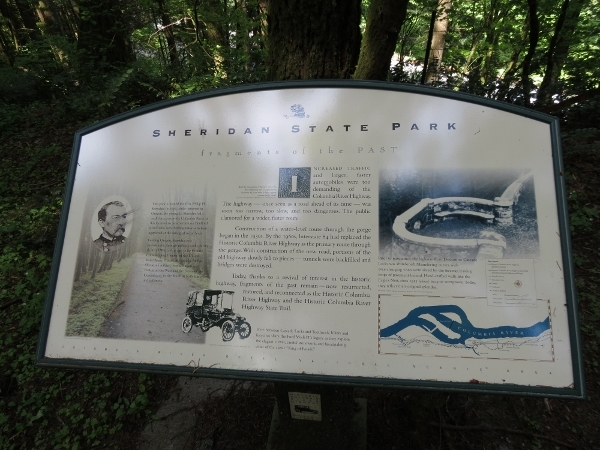 Interpretive signs are all along the trail, detailing the highway’s history. 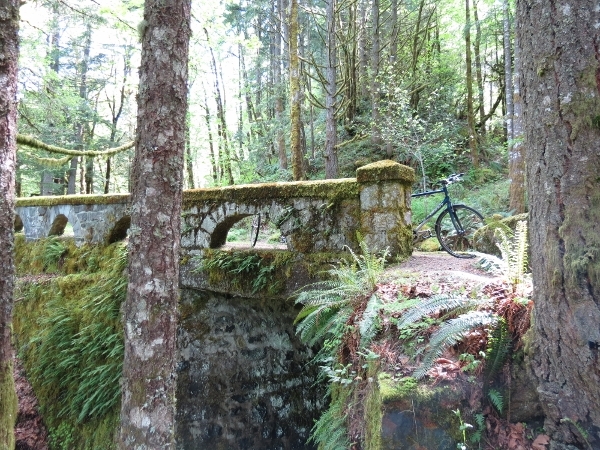 Old bridge over the falls at Ruckel Creek. 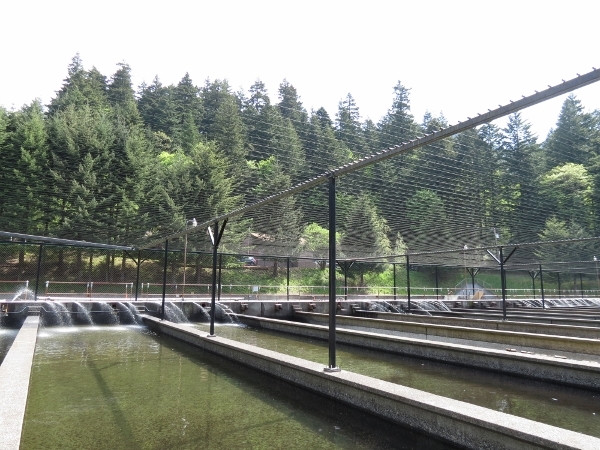 A major hatchery is at Eagle Creek. 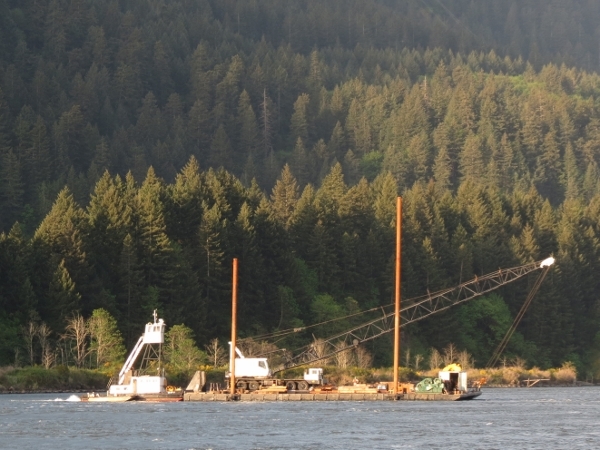 When we were there, the tanks held 4.5 million Chinook smolt. 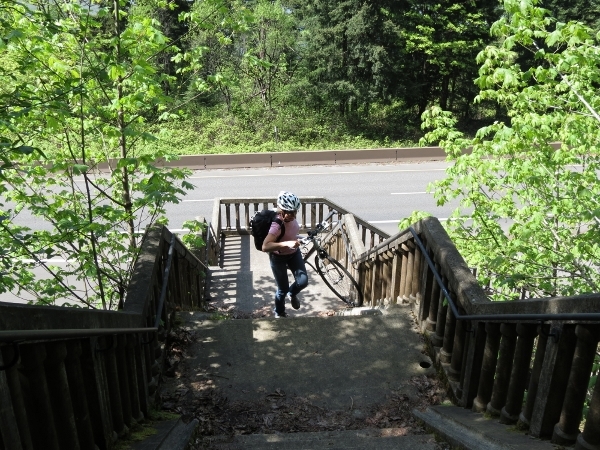 Just beyond the hatchery, an old flight of stairs was the only real obstacle on the path. Our bikes are light, so carrying them up wasn’t difficult. Enjoying the view from one of the old highway lookouts. The old road really was beautifully done. 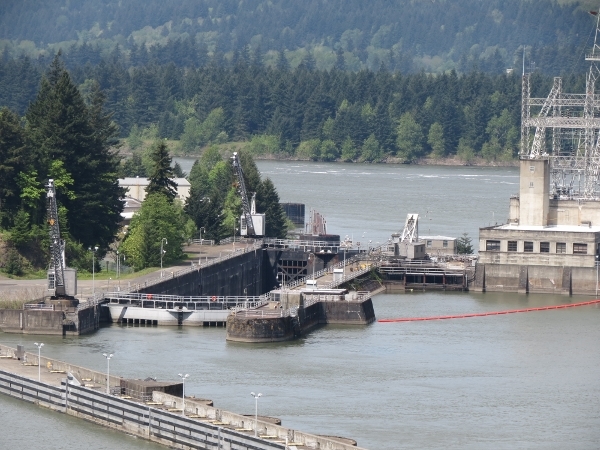 View to the lock and dam from the lookout. The original navigation lock, no longer in use. 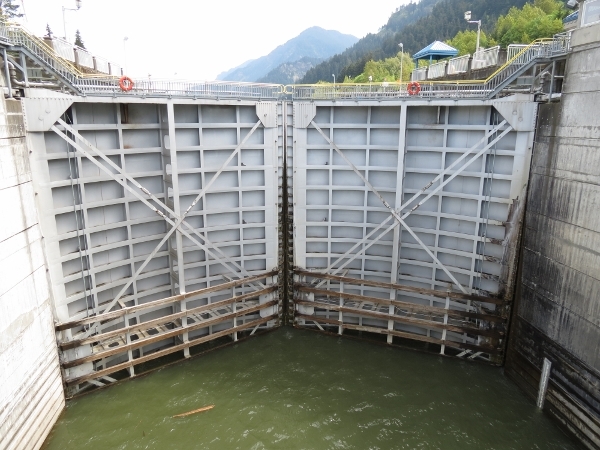 The new navigation lock that we passed through earlier on the trip and will pass through tomorrow. We were quite excited to have arrived and were really looking forward to touring the visitor center. It is supposed to be the best of them all. But Bonneville is even more pedestrian and cyclist unfriendly than Ice Harbor was. If you arrive in a gas-guzzler, you’re good to go. But you are not allowed to walk or pedal to the visitor center. We could visit parts of the site, including Robins Island, but some areas were closed to cyclists and pedestrians. This is the view to the lock gate from the bridge to Robins Island over the lock entrance channel. We stopped for lunch on the Bonneville fish hatchery grounds. Despite the visitor center restriction, we were still having great day. The bike ride along the old highway was really fun. 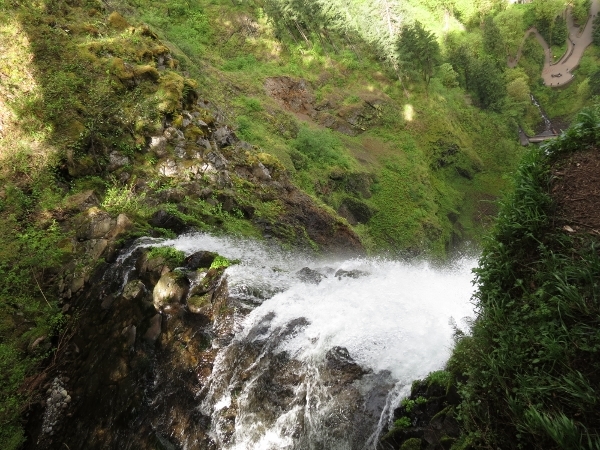 Opposite the Bonnevile facility was the entry to Wahclella Falls on Tanner Creek. The falls were about mile or so away from the trailhead, so we set off. The trail was quite good, and easy to follow. And the falls were spectacular. After the falls, we crossed Tanner Creek on the old highway and continued to the end of the trail, not much father along at Moffett Creek. We slid out backwards between the two sailboats, and then around the corner and out the entrance. The aft helm is handy for maneuvers like this. 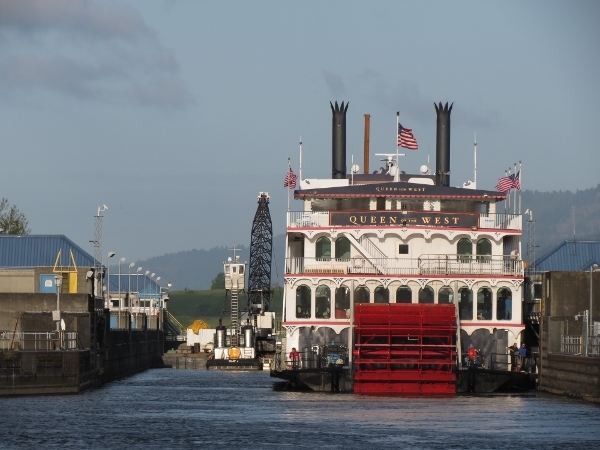 Once we’d cleared the marina about 5:50am, we radiod the Bonneville lock for an opening. We were going to have to wait a bit. 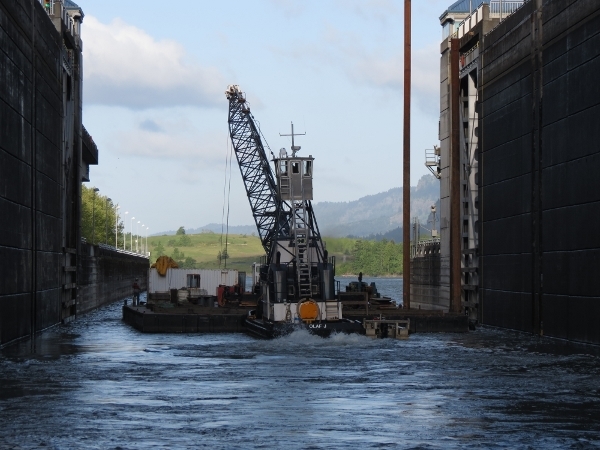 The tug Cascade was already in the locks going down, but couldn’t exit until after 6:30 because the bridge we were on yesterday to Robins Island is closed from 6:00am to 6:30am for employees to cross. 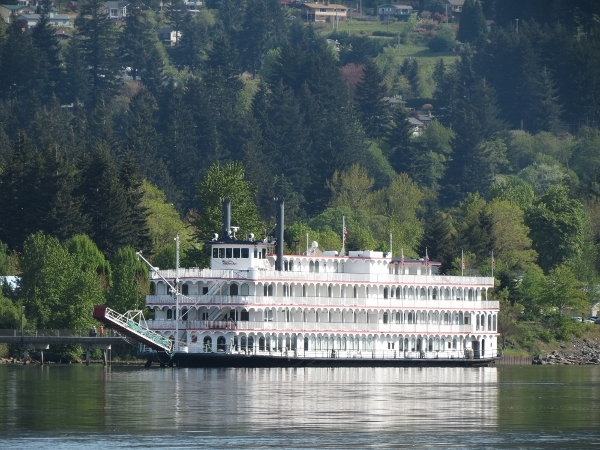 The sternwheeler Queen of the West was also enroute downstream, and the plan was we’d lock through with them, behind them on the starboard wall. Olaf J also was wanting to lock through and radioed Queen of the West to discuss the possibility. They agreed and suggested this to the lockmaster, who replied “I look forward to it. 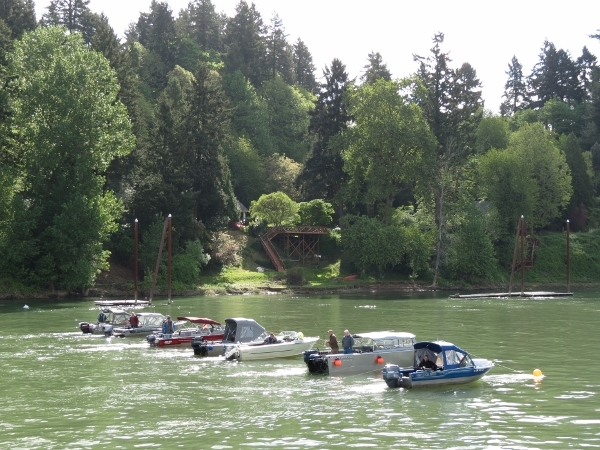 This will be fun.” That’s another difference between this and the Ballard locks in Seattle: here the boats tend to discuss shared locking options and then radio the lockmaster for approval. 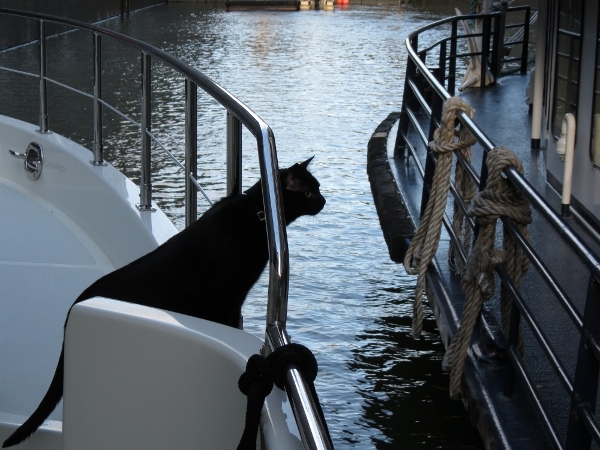 In the Ballard locks, the boats don’t communicate like that and the lockmaster just directs everything. 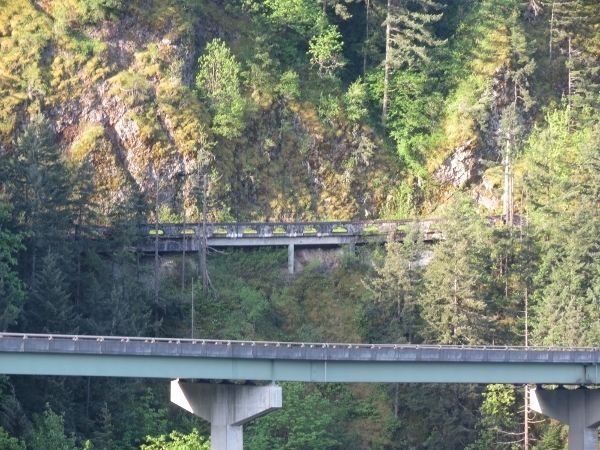 The old highway we biked on yesterday, above I-84. Olaf J needed to tie on the port side, putting Queen of the West on the starboard aft side to make room for the cruise ship’s bow ramp. 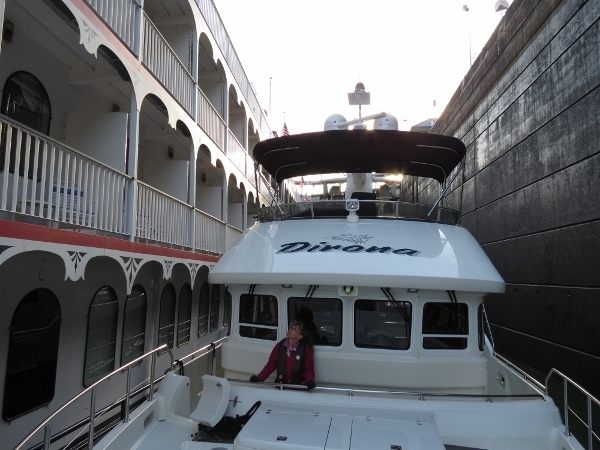 We could go port side on the lock, but opted to tie off the Queen of the West. To tie off on the port side, we’d need to move the kayaks from their racks that extend over that side. Plus we’re assymetrical and don’t have a walkway there, so managing the lines and fenders is more of a hassle. 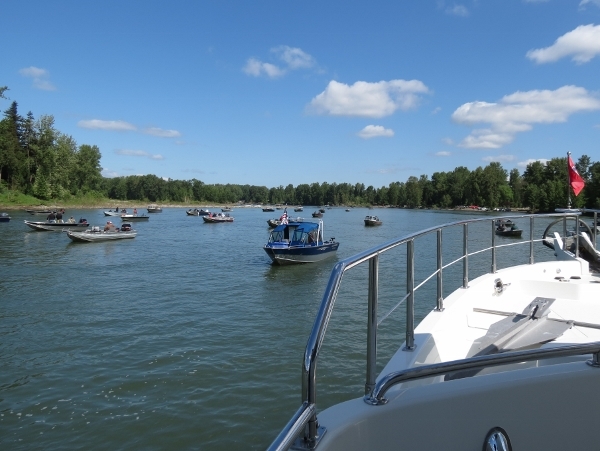 Not as tight as this morning’s marina exit, but not a lot of extra space either. Spitfire, always a little concernd about close quarters, was the star of the locking. A few passengers were interested in our boat and came by to chat. But soon after Spitfire appeared on deck, a crowd formed on the Queen of the West‘s bow to take his picture. Olaf J working hard to exit the locks against the eddies. 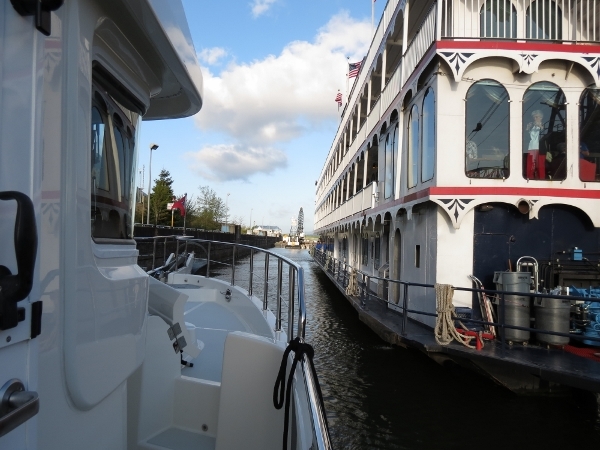 The captain stopped the Olaf J just outside the locks to let the Queen of the West pass. Queen of the West exiting the locks. Queen of the West‘s stern lit up in the morning sun as they pass. 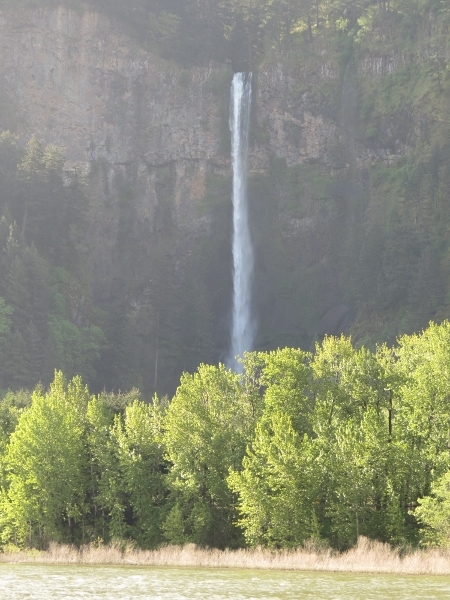 We anchored off Benson State Park to see if we can reach Multnomah Falls, pictured here. The anchorage actually is suprisingly sheltered–we’re enough out of the wind and current that conditions are much calmer than in the main channel. We had a pretty easy time landing the dinghy–the shoreline is steep-to and the brush was fairly light. 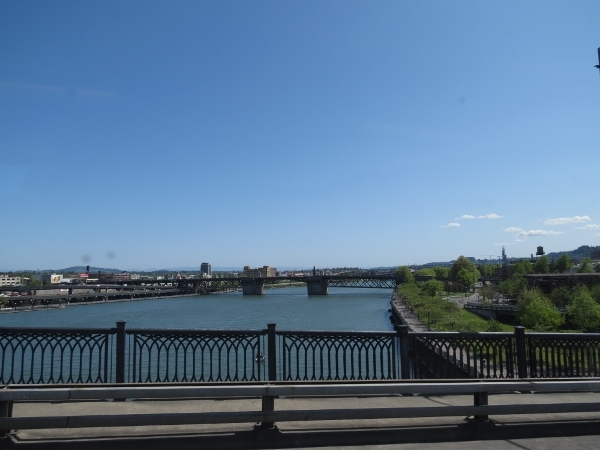 The challenging part is that the park entry is between the I-84 lanes, so we had to cross the two westbound lanes. Fortunately we could see the oncoming traffic a long way off and could wait for a good clear gap in traffic. The falls, with Benson Bridge in front, are spectucular. 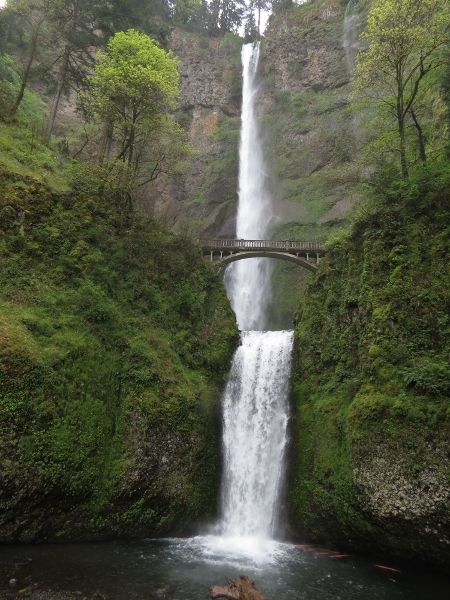 The bridge apparently is one of the most photographed architectural features in Oregon. 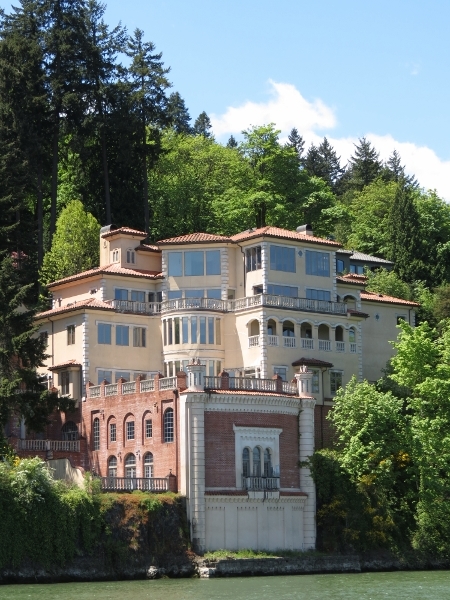 Simon Benson, one of Historic Columbia highway builders, constructed it in 1914. We were wondering if we could reach Benson Bridge, and it turned out a path did lead there. Some serious falling-rock barriers were along the way. Judging by the shape, they’ve caught a few big ones. Then we saw a sign indiciting the top of the falls was about a mile’s walk. We had to do that. This is the view looking back to Dirona from partway up. 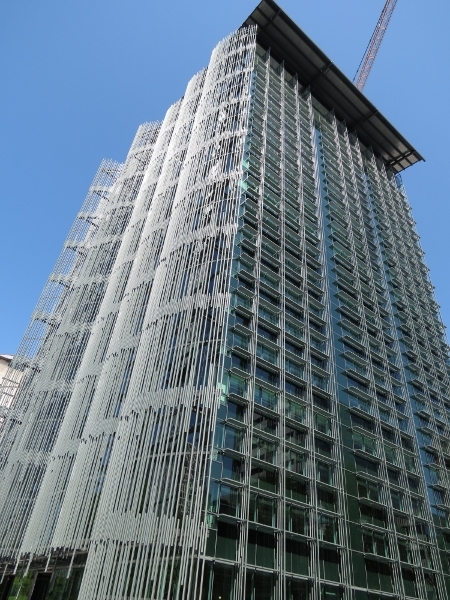 We’re really up there–542′. At the top right is the viewing area and the bridge across the front of the falls. 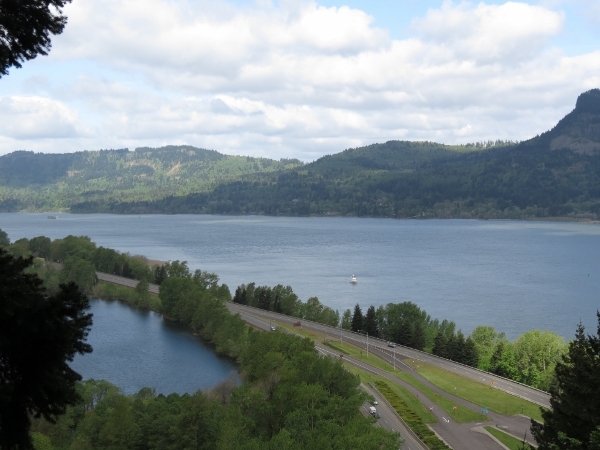 Looking across the Columbia from the viewpoint. Dirona is visible at the mid-left of the picture. 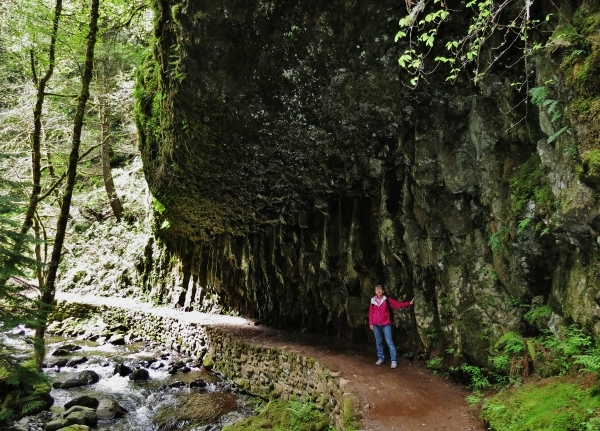 Beyond the viewpoint spur, the trail continued farther along Multnomah creek and crossed on a stone-fronted culvert. The sun-dappled woods were wondefully serene, and the trail was easy to follow. 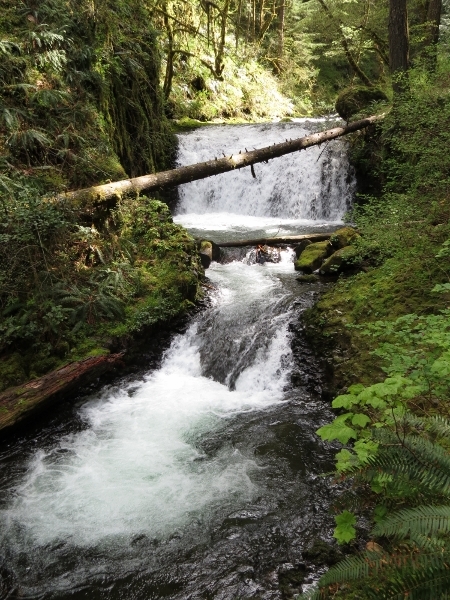 So we continued along the creek and soon came to another set of falls. A stone wall carries the trail through a crescent-shaped cave. 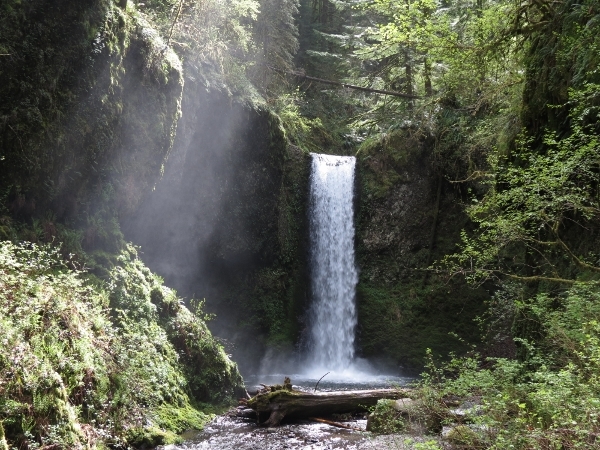 The trail we’re on was built in 1915 by founding members of the Trails Club of Oregon–it starts at the base of the falls and continues to Larch Mountain. 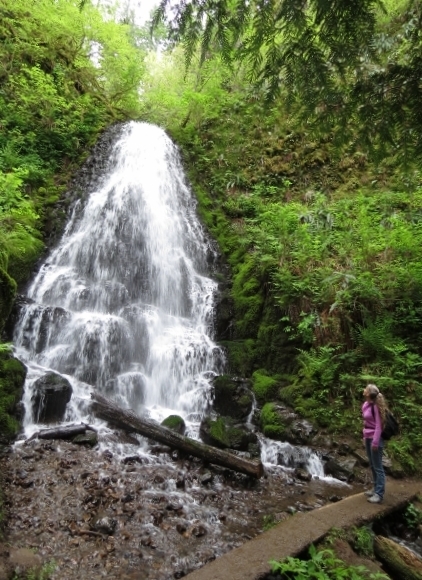 Then we came to the 55′ Ecola Falls. Wow, what a trail. 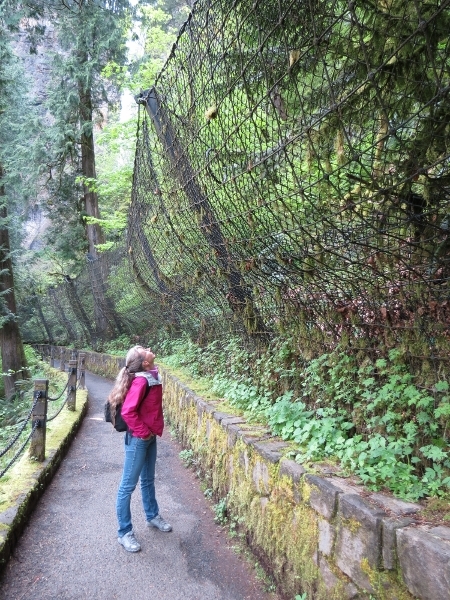 At this point, we’d gained just over 1,000 feet of altitude in the 2-mile walk from the base of Multnomah Falls. Just beyond the falls, the trail forked. A trail map on a nearby tree indicated that the Larch Mountain trail continued to the left and the Wahkeena Trail to the right. 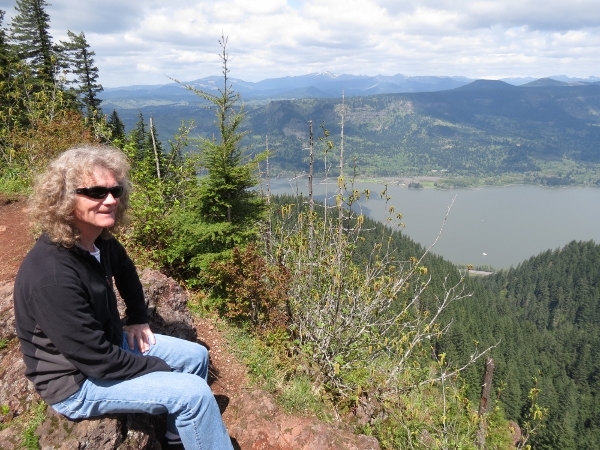 And off the Wahkeena Trail was a spur to a viewpoint, Devil’s Rest, and a loop back down to Multnomah Falls. We’re suckers for a view, and the day was young, so we decided to continue on to Devil’s Rest. 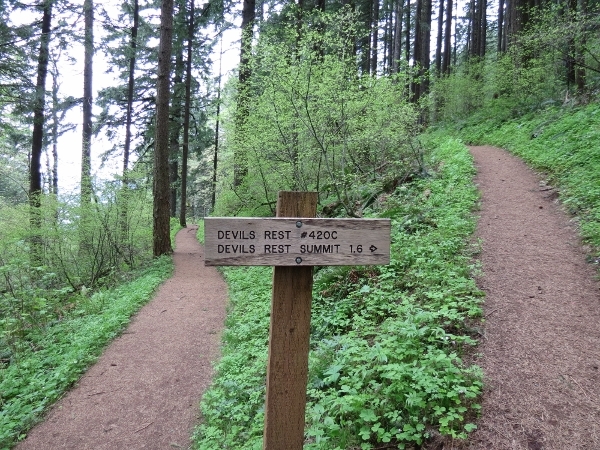 1.6 miles to Devil’s Rest. We’d already hiked way farther than we’d expected to when we left Dirona. But we’d come this far, so might as well get that view. And wow, what a view. That white speck way in the distance close to shore is Dirona. . We were now at 2,500 feet and had sweeping views up and down the river. (For a more interesting visualization of the hike, select terrain view under street map at the top right of the large map). 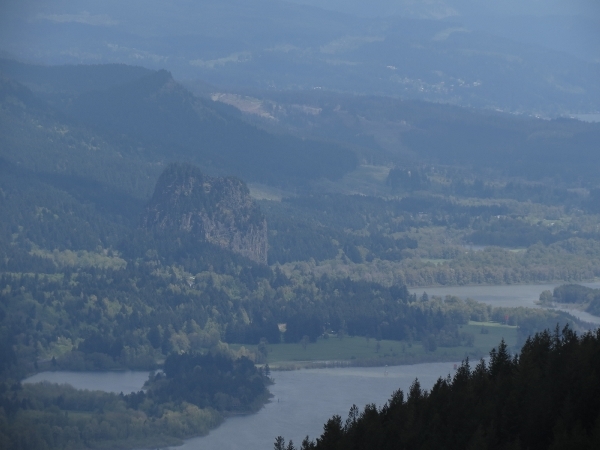 800′ Beacon Rock seemed so big when we’d climbed on our way upriver, but looked pretty puny in comparison. 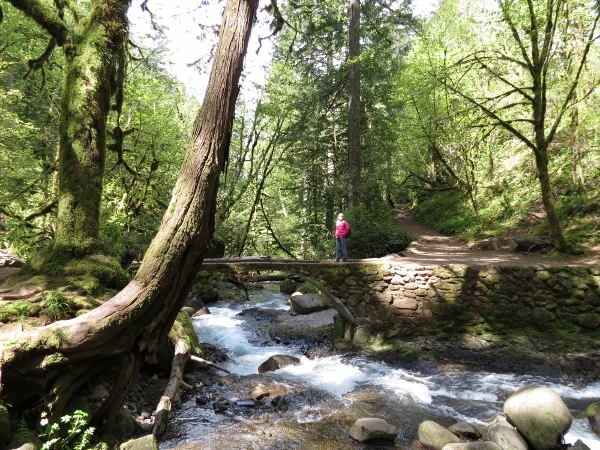 From the Devil’s Rest trail, we returned down along Wahkeena Trail towards Wahkeena Falls. Along the way are the 20-foot Fairy Falls. 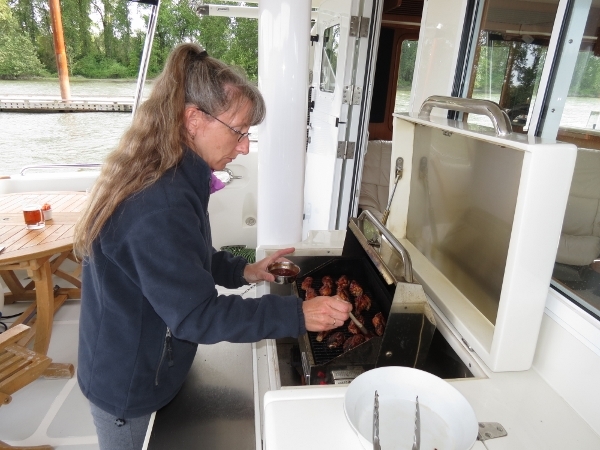 Making chicken wings for dinner on the dock at Government Island. 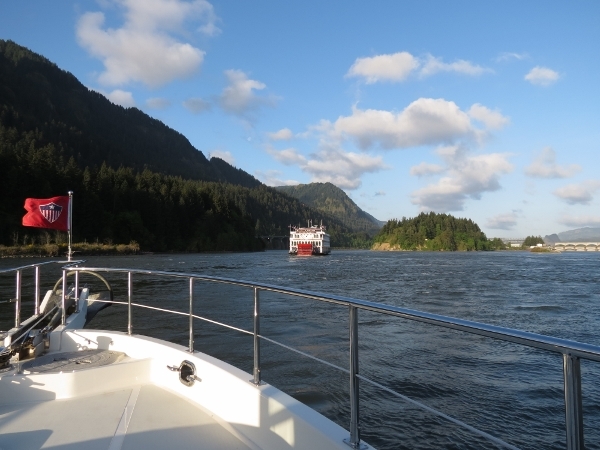 We’d had a lot of excitement for one day: at 5:30am we backed out between the sailboats at Port of Cascades Marina, then went through Bonneville Lock tied off to the Queen of the West, and finally we did a a 2,500 foot, 8-mile hike. We slept well that night. 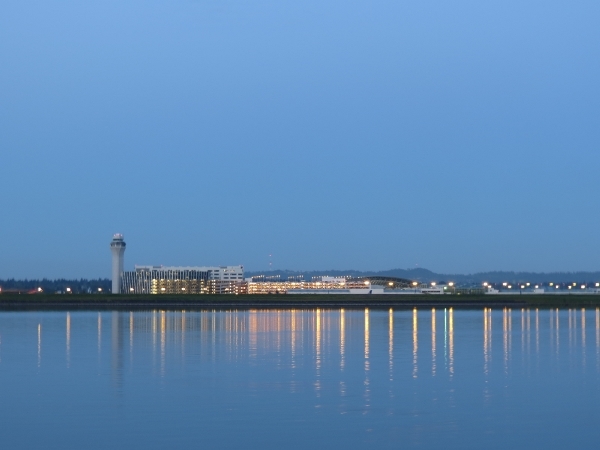 View to the airport at dawn. Back under the BNR railroad swing bridge. Both times we passed, the bridge operator said we could have fit under without an opening. We’d actually tried on the way up, and didn’t feel we had enough room. 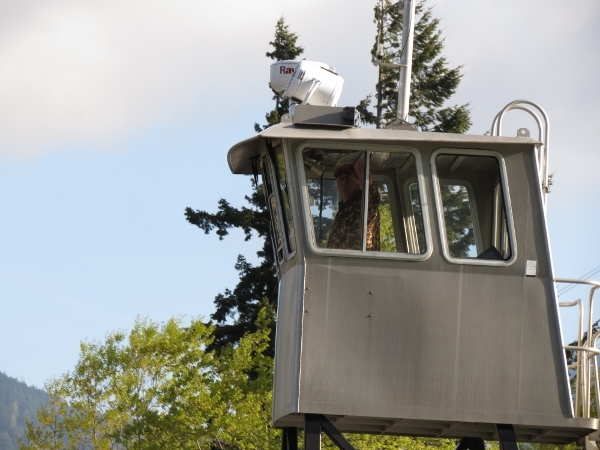 Bridge clearances along the Columbia River system are given in mean lowest low water during lowest river stages. 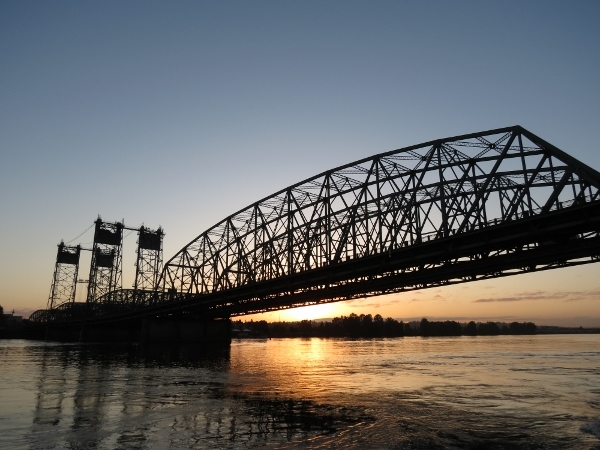 According to the Hawthorne lift bridge, the river height was 5′ and the tide height was 7′. Subtracting that from the charted 39′ for that bridge yields 27′–not enough for our 30′ air draft. The one thing that’s gospel is the guage on the side of the bridge that indicates the current clearance from the waterline. The guage was reading 28′–we would not have fit. Back to big ship country. 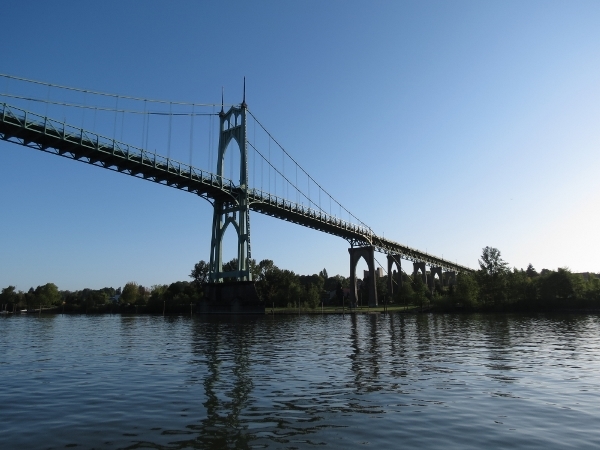 Looking back on the St. Johns suspension bridge, the first of fourteen bridges that span the Willamette at Portland. Ship in drydock at the Portland Shipyard on Swan Island. 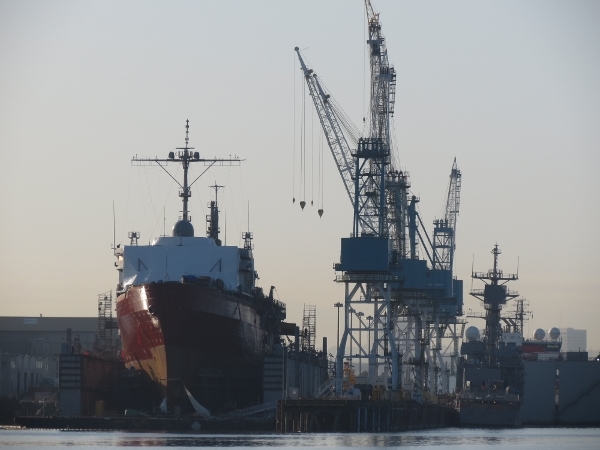 Several large ships were at the yard, including the USS Paul F. Foster to the right of the cranes. Passing under I-405. 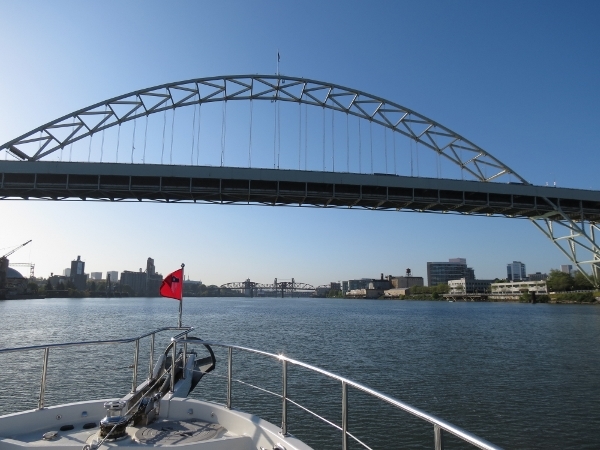 The Fremont Bridge is the second longest tied arch bridge in the world. Looking under the Broadway Bascule Bridge to the double-lift Steel Bridge. The Broadway Bascule Bridge was the longest bascule bridge, or drawbridge, in the world when it was built in 1913. 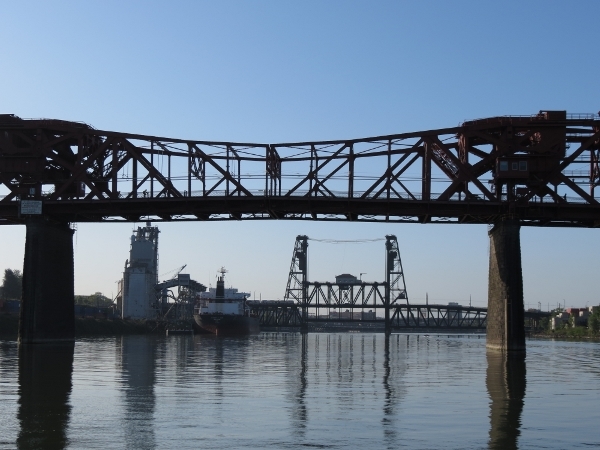 And the Steel Bridge is unusual in having two lifting levels, the top for for traffic and the bottom for rail. 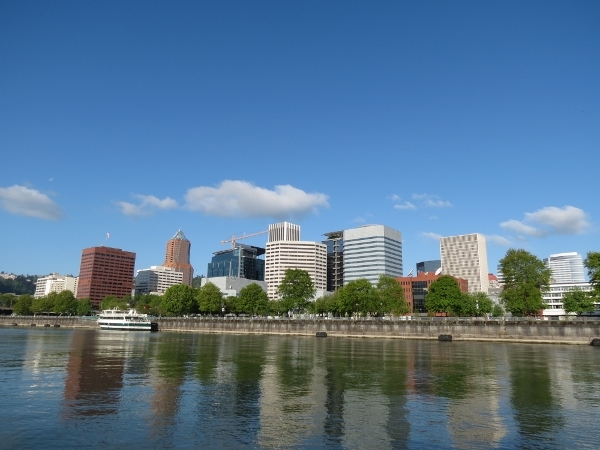 Portland is a city not know for its sunny days. We’ve been very lucky with the weather. Approaching Elk Rock Island. 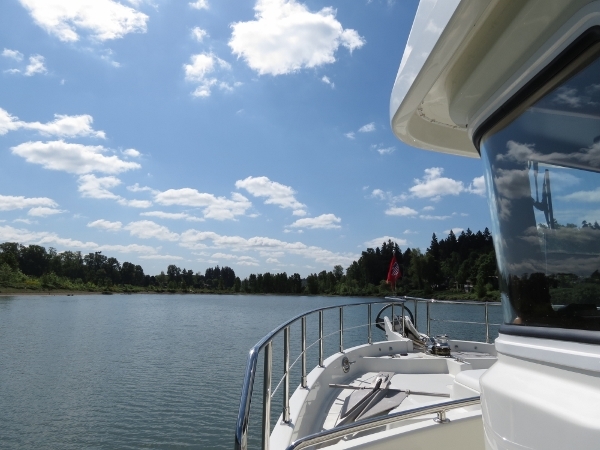 The Willamette River was tranquil and cozy feeling compared to the larger Columbia and Snake rivers. We quite enjoyed our cruise there. 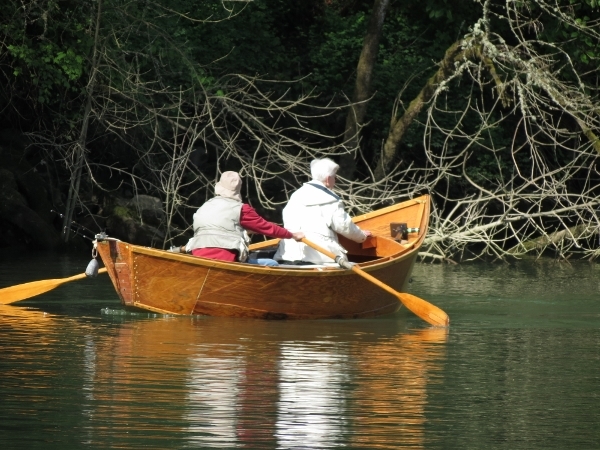 A couple out for a row in a beautiful wooden rowboat. As we neared the river head, the fish boats became thicker and thicker. They anchor side-by-side and deploy a bucket underwater off the stern to keep them in place. We’ve been told they sometimes can block the entire channel, but that the sheriff monitors VHF channel 16 and will quickly come to clear them out if called. 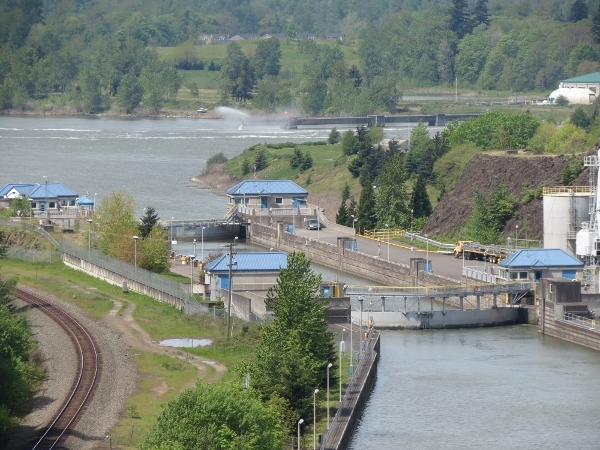 The end of the navigable channel–the US Army Corps of Engineers closed the Willamette Falls Locks in December 2011. 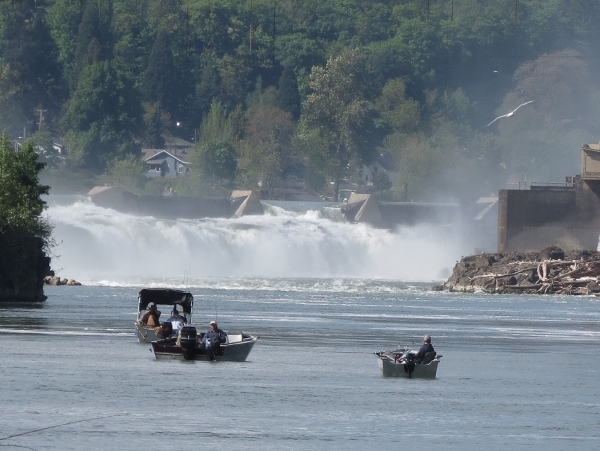 We considered anchoring to take the dinghy in for a closer look to the falls, but the small fish boats were arriving and anchoring en masse with those buckets to hold them in place. None of our buckets were big enough :), so unless we deployed a stern anchor we’d clear out thirty of them in a single wind change. The boats had really filled in since we’d arrived, and working back downstream was tricky. About half were anchored, and the rest were underway randomly upstream with their attention on the fish lines behind them rather than the direction they were moving. The ones that did see us didn’t seem concerned that they were blocking our path. We occasionally sounded the horn when they got too close, and they grudgingly moved out of the way. We stopped of at the cove inside Cedar Island for lunch. 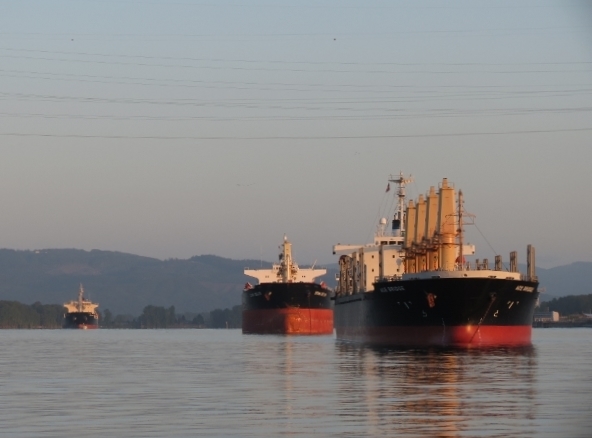 The river adjacent was packed with fishing boats, but the anchorage was calm, secluded, and empty. It was a beautiful spot, and we would have stayed the night if it were later in the day. 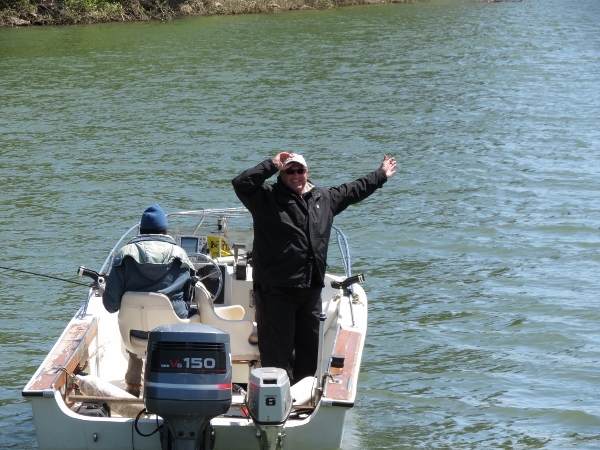 Our friend Stephen Cridlan, who did the photography for our Circumnavigator shoot, saw us on the way upriver while he was out fishing and flagged us down when we returned. 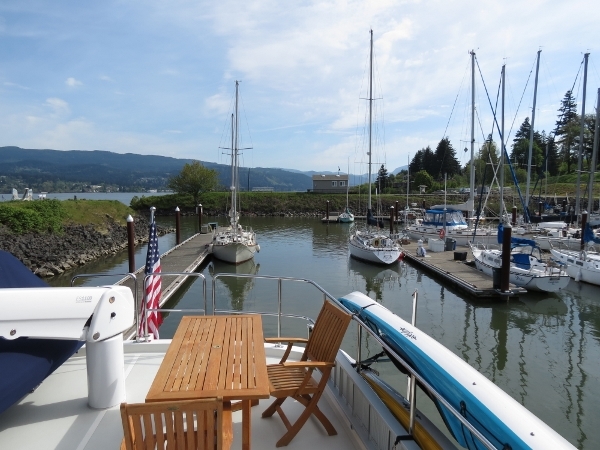 He’d called us on the cell phone after we passed before and recommended some stops, including the Cedar Island anchorage. 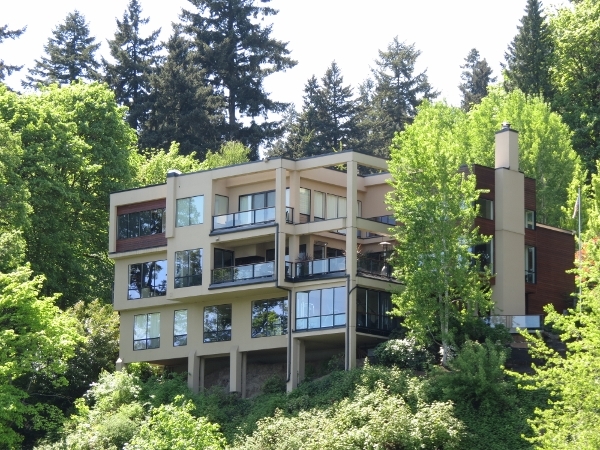 A large and beautiful view home along the river. And this one even larger. 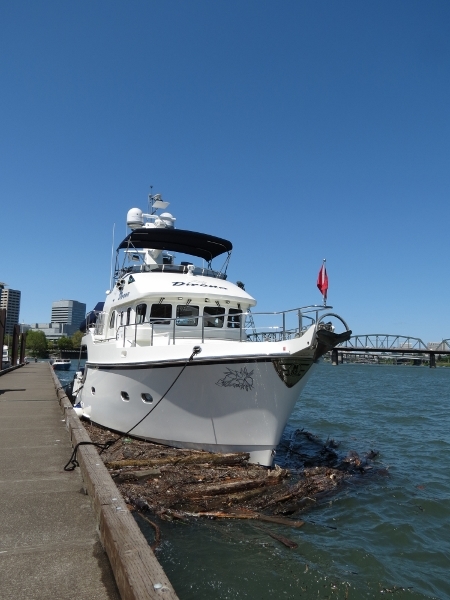 Moored for the night at the public docks off downtown Portland. We collected a lot of wood in a short time. 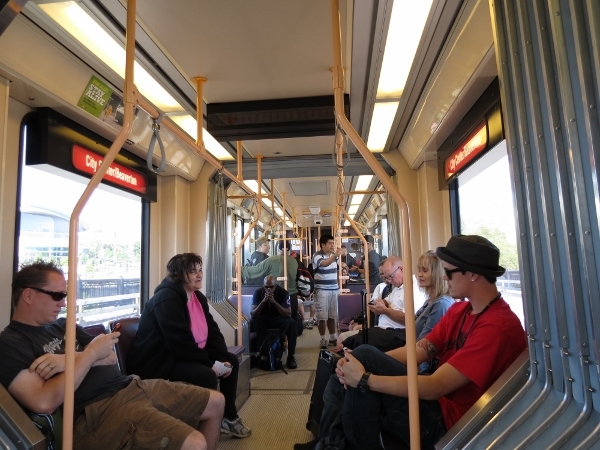 Portland has free rail and bus service throughout downtown. We picked up a tourist map from the hotel by the dock and found a streetcar stop just south of the public dock. 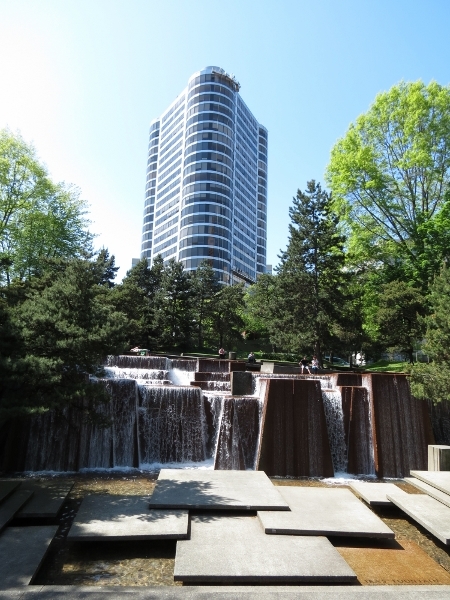 Downtown Portland is full of parks and fountains. Crossing over the top level of the Steel Bridge we’d passed under earlier. The Burnside Bascule Bridge is in the distance. 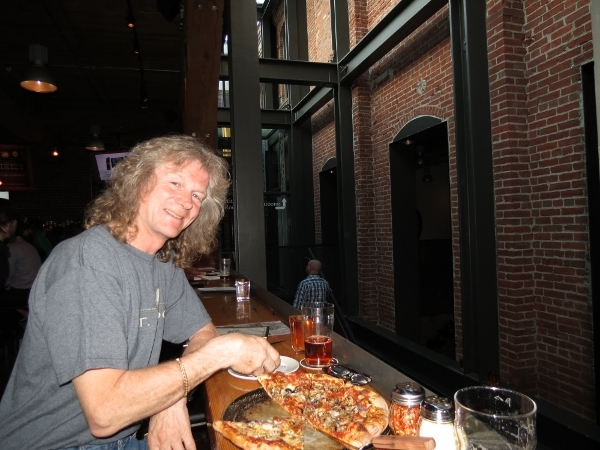 We did a mini-pub crawl, stopping off first at Henry’s Tavern to sample from their selection of over 100 beers on tap. We finished the evening farther north with an excellent meal and pints at the Bridgeport Pub. Hi, Neat post. There is an issue with your website in web eeoxprlr, could check this… IE still is the market chief and a huge part of people will pass over your fantastic writing due to this problem. Hi Joshua, thanks for your cneommt, and glad you like my site. I have checked my site out with IE8 are you using a different version? I also checked it out in Firefox and with Chrome. All three work fine for me. What problem have you noticed?